On Sunday morning, Sept. 13, there will be a partial eclipse of the sun visible in southern Africa, the Indian Ocean and parts of Antarctica. 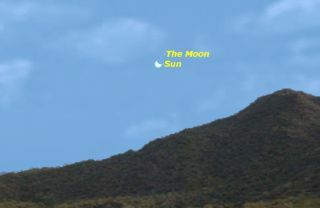 Here it is seen from Cape Town, South Africa, where it will be at its maximum. The penguins are in luck, as are some skywatchers in the Southern Hemisphere: A solar eclipse will be visible from Antarctica, southern Africa and the Indian Ocean on Sunday (Sept. 13). The best view of this partial solar eclipse — the third of four solar or lunar eclipses this year — from an urban area will be from Cape Town, South Africa, where the moon will cover a maximum of 30 percent of the sun. The eclipse will begin in Cape Town just as the sun and moon are rising at 6:49 a.m. local time. Early risers will see a tiny bite out of the sun. At 7:43 a.m., the eclipse will reach its maximum, and by 8:50 a.m., it will be over. The best way to observe a partial solar eclipse is with a filter specifically designed for viewing the sun. Stores specializing in telescopes sell these filters. Safe "eclipse shades" are often widely available prior to an eclipse. A No. 14 welder's glass also works well, and is available from specialized welding shops. The ordinary, No. 12 welder's glass sold in hardware stores to protect welders' eyes from extremely bright light does not provide adequate protection from the sun. If you don't have a proper solar filter, you can view the partially eclipsed sun with a pinhole camera by punching a hole about a millimeter in diameter in a piece of cardboard. Natural "pinholes" created by leaves on trees or reflections from a building's windows will also work. Editor's note: As always, we welcome your pictures of the partially eclipsed sun; a solar filter on your camera will be essential. (The sensor in your camera is just as easily damaged by the direct sun as are your eyes.) Try to get a landmark or tree in the foreground to give a sense of scale. You can send images and comments for possible use in a future story or gallery to managing editor Tariq Malik at: spacephotos@space.com.